Matched Betting Guide: How Does Matched Betting Work? If however you have arrived at this article with no idea what matched betting is then I'm about to open your eyes to a whole new world of online money making. ​Whether you bet regularly or not already matters very little. This is not gambling in its purest form. It is an exploitation of bookmaker bonus offers utilising betting exchanges such as Betfair to cover all outcomes of a event and lock-in free bet cash! If you're a little confused at this point then don't be alarmed! There are literally hundreds of bookmakers operating online today and all of them are fighting for your attention. To entice new customers to sign-up with them, the majority of bookmakers will display and offer some kind of welcome bonus. 1. Place their free bets on what they believe to be an absolute certainty. 2. Bet on a long odds selection and pray to the heavens that it comes in. There will be some people who have experienced success with such methods but sport is unpredictable and more commonly than not these kinds of bets LOSE. Human nature of course normally dictates that more often than not we only hear about significant wins as opposed to these losses. Nobody cares to listen to a loser! The beauty of matched betting is that we can eliminate such misfortune and make sure we ALWAYS WIN. As a general rule of thumb, through matched betting you can expect to profit around 75%+ of the amount of each free bet you receive from a bookmaker. You will make around £7.50 from each £10 free bet, £18.75 from each £25 free bet and £37.50 from each £50 free bet. But, let's be realistic here - how often do these bets win? Instead - with matched betting - we are talking about GUARANTEED, locked-in, consistent wins. You will actually know how much you’ve ‘won’ before an event has even started! The vast number of bookmakers online offering sign up bonuses to new customers and free bet reload bonuses to existing customers means that matched betting can be extremely lucrative. So what's actually involved here? Matched betting is the process of backing a selection at a bookmaker whilst laying that same selection off at a betting exchange in order to cover all possibilities and eliminate the risk. ... But don't panic just yet if you're still a little confused! When you place a bet at a bookmaker you are betting at a stake of your choosing on a specific outcome occurring in an event. BET £10 on Man United to beat Liverpool at odds of 2/1 (3.0). If this bet were to win you would receive £30 back (£20 winnings + £10 stake). If this bet lost you would lose £10. Now let’s flip this bet round and imagine it from the point of view of the bookmaker. If this bet were to lose the bookmaker would make £10. If this bet were to win then the bookmaker would lose £20. If we are able to BET on a selection whilst also placing a LAY on the same selection we create a scenario whereby our wagers cancel each other out. Man United WIN the match. Total Profit: £20 – £20 = £0. Man United DRAW the match. Total Profit: £10 – £10 = £0. Man United LOSE the match. It’s clear to see that if we play the role of Punter AND Bookmaker we will struggle to make money. Most importantly though – we won’t lose money either! Where it comes into its own however is through its ability to allow you to qualify for bookmaker promotions without risking your own money! Once a bookmaker awards you a free bet you can then repeat the process all over again and lock in a guaranteed profit from the bonus cash. Following on from the last page example let’s assume that we had been betting that £10 in order to qualify for a bookmaker free bet of the same value. In order to withdraw the bonus money we would normally have to bet it through once at the bookmaker. We also LAY the bet off for a stake of £10 at a risk of £20. If Chelsea win then the bookmaker will return to us £30 whilst at the betting exchange we would have lost £20. Between the two wagers we would have profited £10. If Chelsea lose or draw then we will have lost nothing at the bookmaker because we were playing with the free bet money. At the betting exchange however our lay would have won which leaves us again with £10 profit. The actual outcome of the event is totally irrelevant to us. Either way we profit in line with the value of the free bet. In this instance: £10. The profit of £10 generated in the example above might seem like pocket change, but what about when it's a £25 free bet? A £50 free bet? A £200 bet basket? Matched betting profits compound into some seriously big numbers - risk-free! If you are not already taking advantage of this unique betting technique then it's time to sit up and take notice. 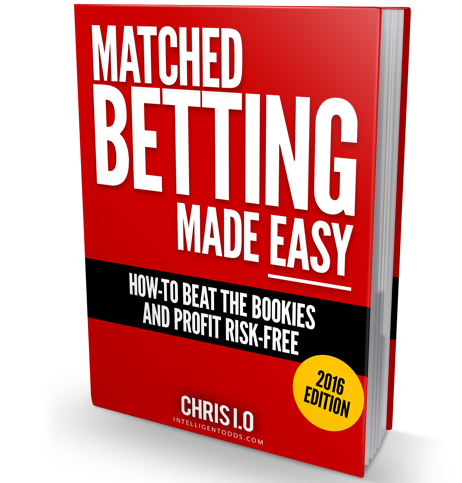 In my self-written eBook I discuss the history of online bookmaking and how the betting world was turned upside down by the arrival of the betting exchanges that paved the way for the very first matched bettors. I then discuss the merits of the process and provide detailed instructions on how to make these unique advantage plays work for you. Make sense of fractional odds vs. decimal odds and study the mechanics of the matched betting process. We look at some real world matched betting examples, how-to find your bets and provide a downloadable betting stake calculator. Uncover ALL the facts. We address the most frequently asked questions and put to bed the most common concerns. Everything has become crystal clear to me at last!" "I can't thank you enough for explaining the process in such easily understandable terms, I am now sure that I can now start to use the system with much more certainty and confidence that was so lacking before." I just wanted to say a big, heart-felt THANKS to you!" "Having read your guide, I now feel I understand the basics, so your guide gave me the confidence and the push to get started." Where should I send your FREE MATCHED BETTING eBook? IMPORTANT: As an added bonus for registering for this eBook, you will also receive free access to the intelligentodds.com newsletter which contains bonus content, exclusive offers, and helpful tips.